Gluten-Free Girl Every Day is one of the best gluten-free cookbooks on the market, mainly because it doesn’t pretend to be a diet book. Instead, it’s geared toward cooking enthusiasts who happen to be gluten intolerant. 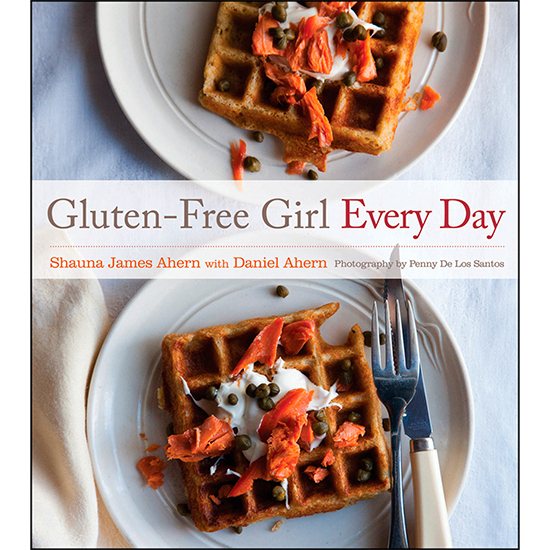 Gluten-Free Girl Every Day ($30; Houghton Mifflin Harcourt) is one of the best gluten-free cookbooks on the market, mainly because it doesn’t pretend to be a diet book. Instead, it’s geared toward cooking enthusiasts who happen to be gluten intolerant. (That spirit is obvious right away, when the author, Shauna James Ahern, writes that lard is her favorite cooking fat.) Ahern, who has celiac disease, is also the cook behind the popular blog Gluten-Free Girl and the Chef. Some of the recipes in Gluten-Free Girl Every Day, Ahern’s second book, are straightforward, obviously gluten-free dishes—kale and sausage soup, chile-lime shrimp stir-fry, berbere-roasted chicken drumsticks and the like—but you’ll find clever tips, tricks and swaps throughout. Here, five of our favorites. 1. Savory oatmeal makes a quick dinner. Rice is a staple of a gluten-free diet, but when you’re riced out, gluten-free rolled oats can be cooked on the stovetop with hot chicken stock, a ladleful at a time, to make a creamy, risotto-like dish. Ahern’s is flavored with caramelized onions, mushrooms and spinach. 2. Brown rice can act as a quiche crust. Ahern combines four cups of cooked, cooled brown rice with two eggs and presses the mixture into a springform pan to form a crust. Then she blind bakes it, pours in a quiche filling and bakes it again until the custard is set and the crust is crisp. 3. Ground corn tortilla chips are as good as panko. Panko (Japanese-style) bread crumbs make light, crunchy coatings, but they contain gluten. For the breading on her chicken strips, Ahern pulses gluten-free corn tortilla chips in the food processor until finely ground. 4. Metamucil gives gluten-free bread structure. Well, not Metamucil exactly—psyllium husks. Many gluten-free baking recipes call for xanthan gum for the structure and texture that gluten normally provides. But Ahern prefers psyllium husks (the main ingredient in Metamucil), which serve the same purpose. 5. Most grains are actually fair game. Gluten-free grains outnumber those that contain gluten. Ahern’s favorites? Millet, brown and wild rice, teff, oats, buckwheat groats and quinoa. You can cook them like risotto or congee, fry them into fritters, toss them into salads or use the flours for baked goods.